Hello everyone, sorry not to post for a while! At the minute Jonathan is training, amongst others, Ballyman, Beware Chalk Pit and the new boy Sacramento King! Glens Wobbly has recently gone on holiday because we are now going into the jump season YAY! The boys are just getting into the hard stuff so I can’t really say when they will run, but I will let you now when they do! The other day Micquus had his first hurdle race and he came 5th and he finished the line still fighting! Micquus will be going into the jump season with the big lads, so good luck to him! We are also training our lovely two year old home bred A Lasting Joy and she is starting to progress really well! The title can mean only one thing. Schooling. We love schooling, there is nothing like taking a three year old for the first time to look at a pole and then gradually make them jump it as the session goes on. It’s every feeling and emotion in one package, a roller coaster ride of an event, so much do we love this feeling that we decided we would do all the three year olds at once! Cue excitement. The day and morning before schooling is greatly exciting, who knows you might uncover a hidden gem, you might have the next Kauto Star in your string of almost well clipped youths. The jockey, Mark Grant, is booked to give the most important horse the most attention (it’s Dance With Me if you were wondering). A lead horse is specially selected from the ranks of the old hands, Across The Straits is judged to be the perfect candidate, not too fit, not too fresh and an excellent technical hurdler and has a special ability. Cue nervous dread. Its nearly go time. Are the jumps set up? Kind of, as much as railings and wooden boxes can be set up. Is everyone here yet? Why isn’t that horses tacked up? Please tell me that horse still has all its shoes on… Okay everything is set to go, everyone mount up. Wait! We forgot about Mark! He’s not here for another hour. Cue the kettle. Okay second attempt, the horses are sent to warm up, just a quick hack round the village and then we can get on with it. The assembled Team in the field wait patiently on foot. Time passes, minutes, hours, days? Regardless they are taking a long time to go round the village. Can anyone see them? Where the hell are they? There they are! On the other side of the valley. Damn. Cue kettle. Okay take three. After their casual stroll round half of Wiltshire they must be ready to go. They are all lined up with JAG (Across the Straits has a nickname!) taking the lead, they first trot over all the poles to get a feel for the event ahead. Well three of them do, the filly is doing doughnuts about fifteen yards away, but eventually she agrees, with much protestation, to go through the first jump. Up goes the poles and a light canter begins, JAG steams straight through them. Too used to hurdles methinks. And again they go up, JAG jumps like a stag clearing the low pole with grace and poise in a fantastic display of agility over a tiny pole bare inches off the ground! Dance With Me follows up immediately behind him and flattens it. The other two trot over the remains of the obstacle. Damn. Cue chaos and despair, this continues for sometime. Shot In The Dark has decided everyone is going too slowly for his liking so he is now thundering down the run of small jumps, either annihilating everything in his path or actually doing a little jumping. But mainly causing destruction, at one point he goes through a slightly elderly looking pole and snaps it clean in two, we scramble quickly to remove the debris from the track. The filly (Bondi Mist) is having a nervous breakdown and is running around in circles making bold moves towards the jumps every now and then, agreeing to jump one of them, possibly two but certainly never three. Dance With Me is trying his best to do some work but its all getting a bit overwhelming while those of us on the ground are trying to take photos and fix the mass devastation of wooden jumping poles. Then, in a move of absolute brilliance JAG throws his special ability into the fray. He stands perfectly still. In the middle of the field while everything is going completely to hell in a handbasket he stands with Katrina sitting on board and waits for everything to calm down. The Boss screams a few tips at his riders, whips crack and reins jangle and a sort of calm descends over the battlefield of the paddock. Shot In The Dark and Bondi Mist are given a couple of attempts to redeem themselves which they dutifully do showing excellent athleticism on the part of SITD and a superb technical ability by Bondi Mist. They are then sent home for a bath and hay while all attention is focused on Dance With Me. JAG leads him and he pops quite a few in very good form, much preferring the more solid jumps where he puts in his best efforts. Cue relief. As the final pair trot off for home I look back over the field, the shattered poles and knocked down boxes and wooden pallets. For all the drama it went very well, they all jumped and showed great ability and willingness to commit. Nobody was injured (horses included) and we are well prepared for next week. Thats right. Next week. Our excursion to Plumpton can be judged as a pretty successful trip, both horses were placed on their first runs of the season and after a considerable amount of time off the racecourse. Ballyman placed third in the 14.40 at Plumpton on Monday and Beware Chalk Pit was placed a valiant second just an hour later. Both horses jumped extremely well and the results reflect that. The ground was slightly on the tacky side for eleven year old Ballyman and we think that slightly better ground will be preferable for his next race and perhaps just a slightly longer trip. Beware Chalk Pit was just edged out of his race and we believe that this run is a good spring board for fitness in his next race. Both horses adore the track at Plumpton and they have both won there before! As much as the horses may love the track the horsebox does not. Shortly after leaving Plumpton the box had a nice blowout and spent several hours waiting for the folks at Equine Rescue to come and change the tyre. Poor Carl and Katrina were not amused but the horses were safe and sound in bed by ten. We had a very enjoyable days racing and we think that the Leftleys had a lovely day out as well. It has also come to our attention that they were not the only ones with some success as a couple of you picked up a bit of money with our strong each way prices. Well done to all! Anyway must be getting on, we are clipping today and the filly (Bondi Mist) is being very fiery! Get in touch with us by commenting or emailing and we will keep you updated as our season progresses. Very important – vets and farriers – to any yard. It is really all about finding one you like ( and who likes you too….). It is so much easier if you believe every word they say and follow their advice accordingly, otherwise you are always looking for a second opinion which is expensive and tiring and makes you feel devious and disgruntled in equal measures! We are so lucky in that when we moved here to East Kennett, two years ago Caroline George agreed to be our vet. We know her well and both she and her practise, Lambourn Equine Practise, are well regarded in the racing world and not too far away! The Trainer regards her prognosis as gospel so a second opinion is never needed! We are equally lucky with our Farrier – Alan Turnell lives in Marlborough and appears at all hours to make sure the horses are shod. He has a lovely way about him and some of our trickiest inmates behave only for him…. Our mare, Tagula Song, is an absolute cow and at stud she has to be put in stocks to have her feet trimmed but when in Alan’s presence she preens and picks her feet up coyly before asked! Anyway – today was a day for both! We caught both mares (phewf) Sir Kyffin’s Folly and Lady Bling Bling (caught by Nicky…!) brought them through the yearling field (chased off by the Trainer) and brought them in for a foot trim, pregnancy dating and worming. 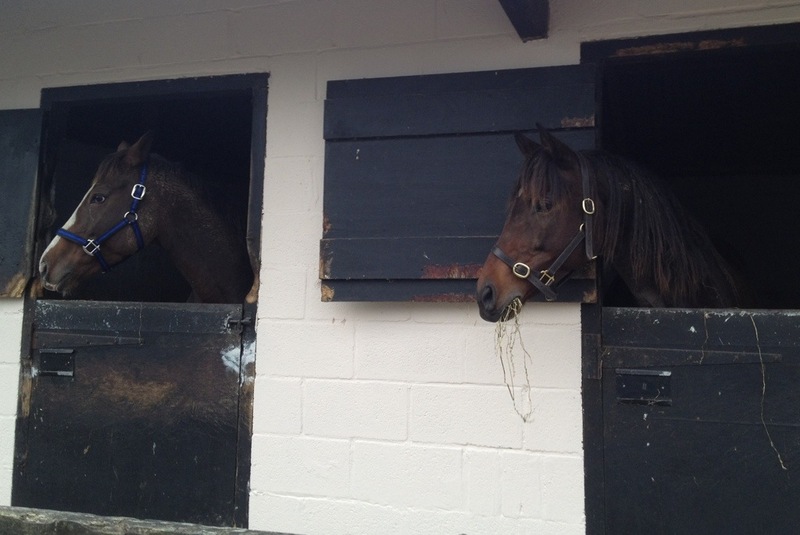 All went well and both mares were confirmed in foal, Folly to Sakhee’s Secret and Bling to Phoenix Reach! It is so exciting as until now we’ve been looking at them getting fatter and fatter and just wondering if they are doing themselves too well! 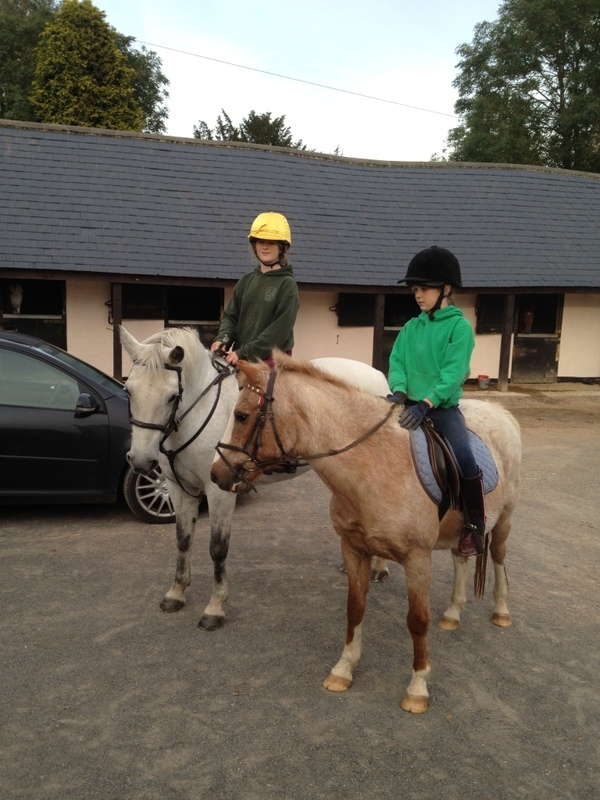 Now, to turn them out – through the yearling’s field again…. Wish me luck! I was a bit disappointed with Shot In The Dark’s first run for the yard at Salisbury yesterday but Liam Keniry (who had ridden him in all his races) felt that he needed the race and needs more than a mile. Mark Grant was in this morning and we made full use of him! He rode Micquus first lot and was pleased with his progression, although this horse is off to Antoinette McKeown’s event yard on 15th October (after her return from Holland). She will give him a holiday before starting his jumping education. 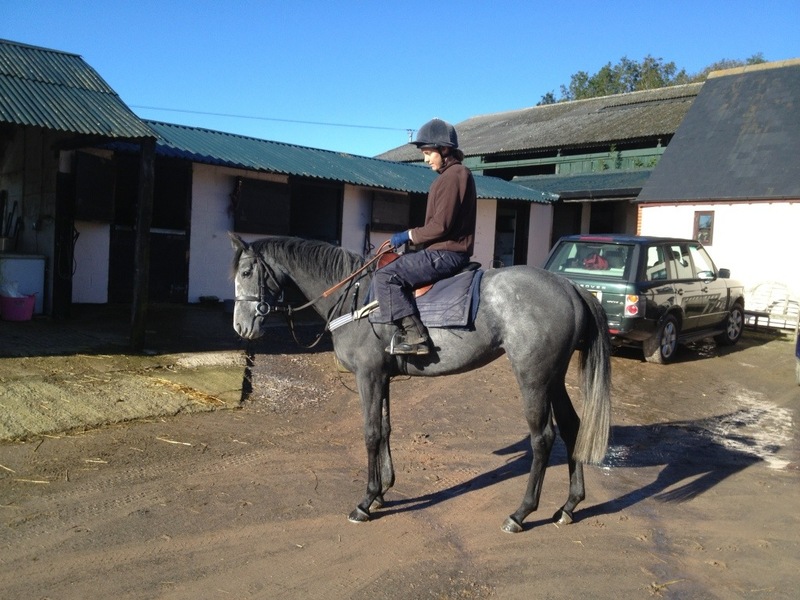 Second lot, Mark rode Beware Chalkpit and Carl rode Ballyman in a bit of work over on the all weather at Greenlands. This is a testing, up hill climb over six furlongs. The all weather was put in by Michael Bowlby for Heidi Sweeting, who subsequently sold the property to the Casini family. This gallop is located two and a half miles from our yard (a good warm up!) and we share it with a few other local equines (the most notable being Andrew Nicholson’s very successful three day event team – including Avebury, Burghley 2012 winner). Ballyman (Max) worked with his usual enthusiasm. Mark reported that ‘Pit’ was working much better than last season and we are putting that down to the fact that he had a throat operation last year which knocked his confidence and we felt that he wasn’t breathing properly but holding his breath and ‘snatching’ for air. He seems to have got over that and he is not too far off a run! We had a breakthrough today when Nikki rode Bondi Mist for the first time since Richard Venn bought her for us from the last Ascot Sales. Unfortunately when she arrived with us she was pickled with spots all over her back, girth and breast girth area (she also arrived with a certificate of non- infectiousness!). We decided that as she’d had a busy season we’d let her have a quiet few weeks until the spots had gone! And today was the day! Across The Straits has had a few days off too so, ridden by the Trainer’s wife, they set off for a bit of road work and were both surprisingly well behaved!! Bondi Mist (Priscilla) will run on the all weather all winter – she is looking for an owner if anyone is interested! However, we will probably syndicate her! Ring the office on 01672 861784 or email Serena on Serenageake@gmail.com if you’d like more details or come and visit!